Groceries are a critical nut for Amazon to crack if it’s to unseat Wal-Mart as the world’s largest retailer. Amazon.com’s latest experiment is a clear indication of where it’s seeking a big chunk of its future bread and butter: the massive world of grocery retail. 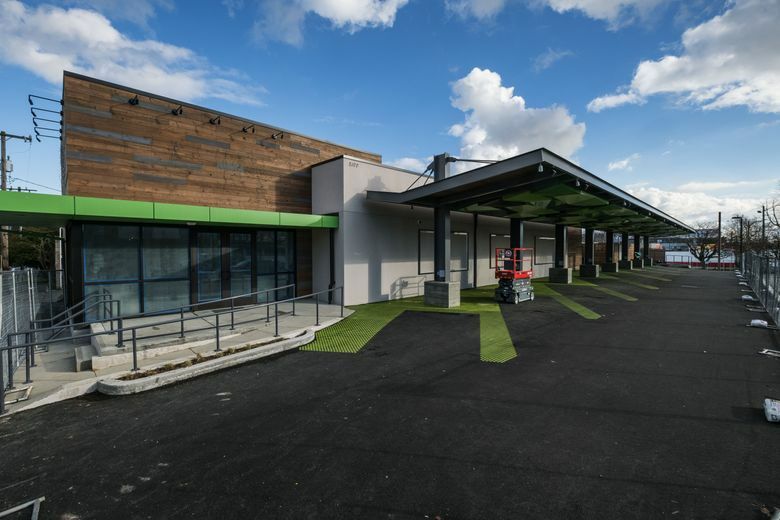 On Tuesday the e-commerce giant unveiled two grocery pickup spots in Seattle’s Sodo and Ballard neighborhoods, under the AmazonFresh brand. That’s the same outfit that launched a decade ago to deliver groceries to customers’ doorsteps in Seattle. It has since expanded to more than 20 metropolitan areas, from Los Angeles to London, but has failed to make a major dent against established supermarket chains, including archrival Wal-Mart. Dubbed AmazonFresh Pickup, the two locations are designed for shoppers who make their purchases online and then select a time to pick them up. An Amazon employee at the pickup site will bring the bags directly to the shopper’s car. The locations have been the target of speculation for months. Tech news site GeekWire first spotted construction at the Ballard location last August, but Amazon, even as it worked on the facilities, remained mum on their purpose. Amazon says that for now the locations are in “beta” mode — that is, available to Amazon employees participating in a test program. But when they open to the general public, they’ll be exclusively for members of Amazon’s $99-a-year Prime loyalty program. The company declined to specify when that would happen. Unlike the AmazonFresh delivery service, which costs $14.99 a month, usage of the pickup locations is free, with no minimum order. Orders can be picked up two hours after purchase. AmazonFresh members, however, will have the special perk of being able to pick up their purchases in 15 minutes. Amazon is not the first to come up with so-called “click and collect” grocery shopping. Supermarket chains from Texas’ H-E-B to Kroger and Wal-Mart offer the service. Yet Amazon may have an edge over its competitors due to the popularity of its smartphone app — roughly 30 million Americans use it on a monthly basis, says Cooper Smith, an analyst at L2, a business intelligence consultancy. The AmazonFresh Pickup facilities are located on First Ave South, in the same building as the Starbucks headquarters in Sodo, where Sears used to be, and at 5100 15th Avenue Northwest in Ballard, the former home of Louie’s Cuisine of China. They’re part of what seems to be a multipronged approach to unraveling the mystery of profitably selling groceries in the digital age. That effort is beset by difficult logistics and by shoppers’ reluctance to buy certain foods, such as produce and meats, sight unseen. Brick-and-mortar stores play a big role in this retail re-imagining. One prominent component is the Amazon Go store, a pilot convenience store unveiled last December in one of the company’s downtown Seattle high-rises. The 1,800-square-foot store has technology similar to that used in self-driving cars; shoppers can walk in, pick up a product from the shelf and walk out the door without dealing with a cashier, as the item is automatically charged to their account. The store is in beta mode, available to Amazon employees only. It was expected to open to the public in the early part of 2017, but The Wall Street Journal reported Monday that the opening had been delayed due to hiccups with the technology used to track people and products in the store. Another idea under consideration, according to a person familiar with the matter, is a larger, highly automated multiformat store that would serve as a neighborhood grocer, a warehouse for nearby Amazon deliveries, and as a kind of technological embassy for new ways to shop. Customers would be able to walk in, drawn by a basic selection of fresh items. While they shop for eggs and milk, Amazon employees in the back of the store, aided by a fulfillment system, can prepare a basket for the customers with a more diverse selection of products that they can walk out with. They could also have their purchases delivered to their car by ordering in advance, like in the pickup locations unveiled Tuesday, or have them dropped off at home a few hours later. It’s a model that would help people get used to the idea of buying fresh food and other groceries from Amazon, and nudge them to buy more of it online. The concept is not much different from a two-story store design described by Brittain Ladd, a former Deloitte consultant who now works on Amazon Fresh’s expansion. In a Linked In post published in 2013, before his Amazon tenure, Ladd wrote that despite the logistics complexity required in such a store, its lower labor and other costs could make it extremely profitable — with margins between 22 percent and 40 percent, much higher than the single-digit margins that supermarkets usually eke out. Groceries are also part of a wider push by Amazon into the physical world, a campaign in which Seattle serves as a staging ground. In 2015 the company opened its first brick-and-mortar bookstore at U-Village. Recently it announced what will be its 10th bookstore at Bellevue Square. The New York Times reported that Amazon is also pondering brick-and-mortar emporia for appliances and furniture. In the meantime, Amazon’s pickup locations are “the best indication yet that Amazon is going to be extremely persistent when it comes to disrupting groceries,” said L2 analyst Smith, potentially impacting the bottom line of its competitors.